When I started my blog a little over 4 years ago, one of my goals was to be motivated and inspired to cook from my overflowing freezer and pantry. I’ve had mixed results with that objective. Howard would say it’s more of a negative flow, in other words, the coffers seem to fill more and more instead of emptying. I was reminded of my resolution though when I recently had trouble finding something that I just knew was in the freezer somewhere. I can’t remember what it was, but I know that, with frozen fingertips, I did eventually find it in the back of the bottom shelf of the upright freezer. This experience renewed my intention of being creative with ingredients I have on hand. In my search for the mystery item, I came across a package of goat stew meat from back when we were in a meat CSA, before the meat delivery outran the pace of our consumption. With the weather decidedly colder, a pot of stew seemed in order. After a survey of the food on-hand, and a little internet browsing, I was inspired to make a tagine, no further grocery shopping required. I had canned tomatoes and chickpeas on the shelf as well as onion, garlic, and butternut squash from our Winter CSA. The Moroccan spices added culinary warmth that was lacking outside. 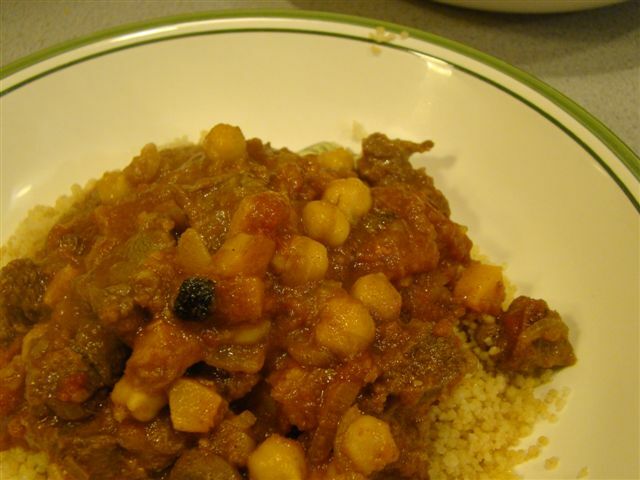 Served over a bed of quick-cooking couscous, the pseudo-exotic stew made a satisfying meal. If goat is too exotic for you, or you don’t have a ready source, this would be delicious with lamb instead. If you’ve never tried goat, do! Globally, it’s the most popular meat. It’s not as strong and gamy as lamb, yet it has a different taste than beef or pork. Try it, you’ll like it! In a bowl, season the meat with salt and pepper. In a medium-sized Dutch oven, heat 1 Tbsp olive oil over medium heat. Brown the meat on all sides, about 5 minutes. Add the onion and garlic. Cook until the onion starts to soften, about 5 minutes. Stir in the cinnamon, coriander, and cumin. Allow flavors to bloom for a few minutes. Add chopped tomatoes and the juice. Bring to a boil, then lower the heat. Simmer for 1 hour. Meanwhile, heat the oven to 400F. In a bowl, toss together the butternut squash pieces and the remaining 1 Tbsp olive oil. Season with salt and pepper. Spread the squash in a single layer on a baking sheet. Bake 20-25 minutes, stirring halfway through, until tender and somewhat browned. Add the roasted squash and chickpeas to the stew. Continue to simmer for about 10 more minute to allow the flavors to meld.